Randomized controlled trials (RCTs) are used to evaluate the efficacy of drug therapies in controlled conditions and in selected groups of patients. Therapies found to be efficacious in RCTs are not always found to be effective in routine care, particularly for chronic conditions such as asthma, as a result of real-life factors such as patient heterogeneity and suboptimal adherence.1 Classical RCTs also tend to include highly selective patient population, representing as little as 5% of routine care patients.2 Thus, many classical RCTs have high internal validity to demonstrate the efficacy of treatments in ideal patient populations under optimal management, but are more limited in terms of their wider generalizability. Observational research to evaluate real-life effectiveness therefore offers an important source of complementary evidence. Despite increasing acceptance of its potential value, concerns about the reliability of observational research persist3–5 and remain barriers to its widespread acceptance and interpretation. To this end, we aimed to evaluate the clinical utility of several asthma database outcomes used in our previous studies.16–18 In particular, we investigated the following: 1) how useful these database outcomes were for providing insights into asthma control, compared to information gained from patient-reported questionnaires; 2) how well the database outcomes performed in assessing response to effective treatment; and 3) how well the database outcomes predicted future asthma exacerbations. To do this, we used database electronic medical records (EMRs) and linked questionnaire data from a large population of patients with asthma managed in routine primary care in the UK. This study used data from the UK’s Optimum Patient Care Research Database (OPCRD)19 – a primary care database containing anonymized, routinely recorded clinical data from over 4.5 million patients. More than 600 primary care practices across the UK contribute routine EMRs to the OPCRD, and ~10% of patients with asthma within the database have complementary, linked patient-reported outcomes (PROs) captured through self-completed asthma questionnaires that were routinely mailed to patients after a clinical visit. The OPCRD is maintained by Optimum Patient Care and has ethical approval from the National Health Service (NHS) Research Authority to hold and process unidentifiable research data (Research Ethics Committee reference: 15/EM/0150). This study was approved by the Anonymised Data Ethics & Protocol Transparency (ADEPT) Committee, which is an independent scientific advisory committee commissioned by the Respiratory Effectiveness Group for the OPCRD (REG; www.effectivenessevaluation.org).20 This study was designed, implemented and registered in accordance with the criteria of the European Network of Centres for Pharmacoepidemiology and Pharmacovigilance (ENCePP; registration number: EUPAS13194). To explore the clinical utility of asthma database outcome measures, we evaluated several outcomes from the published literature within the OPCRD16–18 and compared them to semantically similar PROs, assessed their responsiveness to efficacious asthma therapy (inhaled corticosteroids [ICSs]) via change in end points before and after treatment initiation and step-up, and evaluated their association with future asthma exacerbation risk. To compare database outcomes and PROs, data from routine care EMRs were extracted within a week of patients being invited to complete an asthma questionnaire. PROs were obtained directly from questionnaires posted to the patients at the time their practice data were inputted to the OPCRD (typically returned within a month of questionnaire mailing), and comparator database outcomes were evaluated from routine care EMRs over the prior 12 months (a 13-month evaluation period in total). The patient cohort with linked EMR/PRO data is hereafter referred to as the “Questionnaire cohort”. Separate cohorts were used to investigate the responsiveness of asthma database outcomes to efficacious therapy and to assess the association between database measures and future asthma risk over a 2-year study period. The database outcomes were evaluated over one baseline year prior to an index date, defined as either 1) the date of a patient’s first ICS prescription (“ICS initiation cohort”) or 2) the date at which a patient received a ≥50% increase in the maintenance ICS dose (“ICS step-up cohort”). The same database outcomes were assessed in the year immediately following ICS initiation or step-up. Responsiveness was assessed through the evaluation of changes in outcome measures from baseline to outcome years (pre-/post-therapeutic intervention). Association with future risk was evaluated by examining the strength of association between database outcomes (or their disaggregated components; described in the “Study outcomes” section) at baseline and exacerbations during the outcome year. The ICS initiation and step-up cohorts were analyzed separately. Patient data for the Questionnaire cohort were extracted over the period 2010–2013. Patients were included if they had an asthma diagnosis recorded in their EMR, with no subsequent “asthma resolved” Read code; had data available for extraction up to at least the year 2010 (to allow ≥13 months’ complete outcome data at the time the study was conducted); were continuously registered in a practice throughout the study period; received at least one respiratory prescription in the 2 years prior to the index date; had full questionnaire data linked to their EMRs; and were aged 18–60 years at the time of index date. Patient data for the ICS initiation and step-up cohorts were extracted over the period 1985–2011. Patients were included if they were aged 5–60 years at the index date; had a Read code “asthma diagnosis ever”; and had at least 2 years’ continuous data (at least 1 year before and 1 year after the index date). ICS initiation patients were defined by having received a minimum of two asthma-related prescriptions in the baseline year (none for ICS), an initial ICS prescription at the index date and at least two prescriptions for asthma-related therapies in the outcome year. 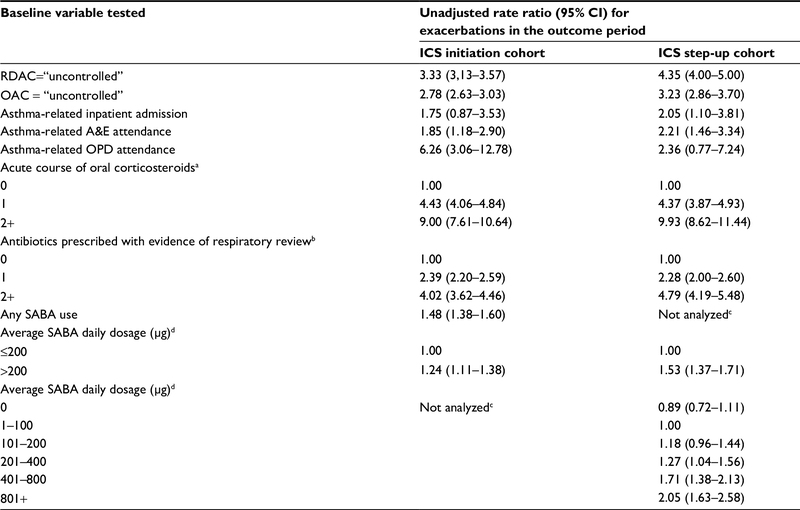 ICS step-up patients had two or more asthma-related prescriptions during the baseline year (at least one for ICS), an increase of ≥50% baseline ICS dose at their index date ICS prescription and at least two asthma-related prescriptions in the outcome year. Patients were excluded from any of the above cohorts if they had a diagnosis for one or more chronic respiratory conditions other than asthma, if they received prescriptions for multiple ICS types or ICS as part of a fixed-dose combination therapy at the index date, or if they received maintenance oral corticosteroids (OCSs) during the study period (Questionnaire cohort) or baseline year (ICS cohorts). Datasets were examined for duplicate patient entries using unique patient IDs. Inclusion and exclusion criteria are illustrated in Figures S1–S3. Lists of Read codes used to select patients are included in the Supplementary materials. The rule used to identify maintenance OCS is illustrated in Figure S4. We examined the properties of three asthma-related database outcomes: a measure of asthma exacerbations and two measures of asthma control as described in brief below. Full details of outcome definitions can be found in the Supplementary materials. Database severe exacerbations were defined based on the American Thoracic Society/European Respiratory Society (ATS/ERS)14 Task Force definition, as the occurrence of any of the following during the assessment period: asthma-related hospital admission or emergency department (ED) attendance, or an acute course of OCS with evidence of respiratory review. Two database measures of asthma control, as defined in previously published asthma studies,16–18 were evaluated: 1) risk domain asthma control (RDAC) and 2) overall asthma control (OAC). Patients whose asthma was “uncontrolled” in terms of RDAC were those who had any of the following during the 12-month assessment period: asthma-related hospital admission, ED or outpatient department attendance; acute use of OCS with evidence of respiratory review; or antibiotics prescribed with evidence of respiratory review. Asthma was “controlled” in terms of RDAC for those who had none of the above events/prescriptions over the assessment period. In these studies, patients were classified as “controlled” in terms of OAC if they were classified as “controlled” by RDAC and (as a proxy for low symptoms) used an average daily dose of short-acting beta-agonist (SABA) ≤200 μg (salbutamol) or ≤500 μg (terbutaline; Supplementary materials can be referred for average daily SABA dose calculation). Patients were classified as “uncontrolled” in terms of OAC if they had uncontrolled RDAC or used an average daily SABA dose of >200 μg salbutamol or >500 μg terbutaline (corresponding to >3.65 SABA prescriptions in 12 months). 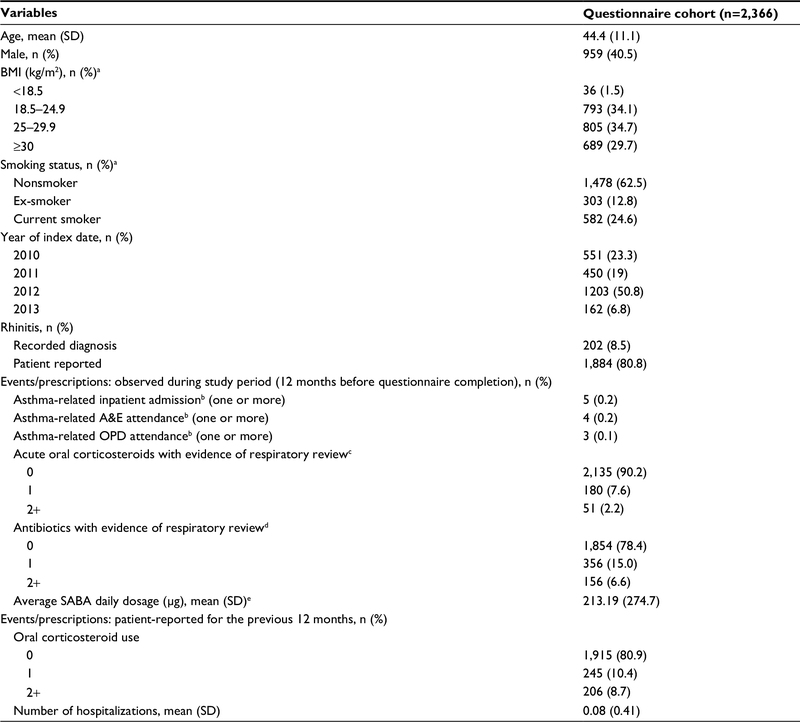 Patient-reported symptom control was determined from patient responses to questions about the number of days they experienced asthma symptoms during the day, and the number of times they had used a reliever inhaler in the last 7 days. They were also asked whether they had any nighttime waking or activity limitation during the past 4 weeks, for which the response options were “yes”, “no” or “unsure”. The following questionnaire items were then used to categorize symptom control: 1) daytime asthma symptoms on more than 2 days during the previous week, 2) use of a reliever inhaler more than two times during the previous week, 3) any nighttime waking due to asthma during the previous 4 weeks, and 4) any activity limitation due to asthma during the previous 4 weeks. If none of these items were present, the patient was considered to have “well-controlled” symptoms; if one to two of these items were present, symptoms were considered “partly controlled” and if three to four of these items were present, symptoms were considered “uncontrolled”. The questionnaire also asked about their asthma-related health care resource utilization over the previous 12 months. Using these data, a patient-reported exacerbation was defined as a positive response to any of the following: receipt of a course of OCS for worsening asthma, time off work/school because of asthma or hospitalization (inpatient admission) due to asthma. Baseline summary statistics for patient characteristics were computed for each of the study cohorts. Counts and percentages were computed for categorical variables, and mean values and SDs, or median and interquartile range, for continuous variables, depending on distribution. 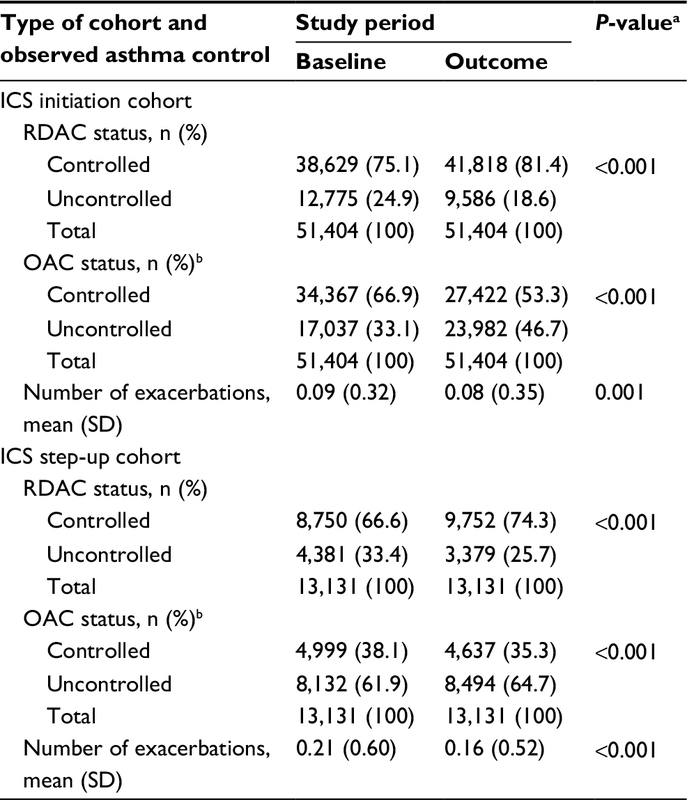 For each ICS cohort, McNemar tests were used to compare the proportion of patients with uncontrolled asthma defined by RDAC or OAC, pre- and post-index date. Wilcoxon’s signed rank test was used to compare the mean database exacerbations in the years before and after the index date. Poisson regression was used to assess the association between baseline asthma control, or their disaggregated components, and exacerbations during the outcome year. Variables were fitted univariably, and unadjusted rate ratios (RRs) with 95% confidence intervals (CIs) were estimated. For the main analysis, this was carried out separately in the ICS initiation and step-up cohorts. A sensitivity analysis was carried out in a subgroup of the ICS step-up cohort – patients who had stable therapy in the outcome year, defined as no add-on therapy and/or a ≥50% increase in the existing ICS dose. All analyses were carried out using IBM SPSS Statistics version 21 (IBM Corporation, Armonk, NY, USA), SAS version 9.3 (SAS Institute, Cary, NC, USA), and Microsoft Office Excel 2013 (Microsoft Corporation, Redmond, WA, USA). The level of statistical significance was set at 5%. After applying inclusion/exclusion criteria, 2,366 were found to be eligible for the Questionnaire cohort, 51,404 for the ICS initiation cohort, and 13,131 for the ICS step-up cohort (Figures S1–S3). Questionnaire cohort patients had a mean age of 44.4 (SD, 11.1) years, 40.5% were male, 29.7% had a body mass index [BMI] of 30 or above and 24.6% were current smokers (Table 1). There was large disparity between the proportion of patients with a database-recorded diagnosis of rhinitis (8.5%) and the proportion with patient-reported rhinitis symptoms (80.8%). During the study period, <1% of patients had asthma-related hospital attendance, according to EMRs. Two or more prescriptions of acute OCS with evidence of respiratory review were identified in 2.2% of patients via the database, while two or more instances of OCS use were reported by 8.7% of patients. Notes: aBMI data were missing for 1.82% of patients; smoking status was unknown in 0.1% of patients. bAsthma-related refers to records coded with a lower respiratory code, including asthma and lower respiratory tract infection codes, or a generic hospitalization Read code which has been recorded on the same day as a Lower Respiratory Consultation (defined in the Supplementary materials). cDefined as all courses that are definitely not maintenance therapy; and/or all courses where dosing instructions suggest exacerbation treatment (eg, 6, 5, 4, 3, 2, 1 reducing, or 30 mg as directed); and/or all courses with no dosing instructions, but unlikely to be maintenance therapy with a code for asthma or a lower respiratory event; and/or no or undefined dosing instructions but definitely not maintenance therapy, where “maintenance therapy” is defined as daily dosing instructions of ≤10 mg prednisolone or prescriptions for 1 mg prednisolone tablets. dEvidence of respiratory review is defined in the Supplementary materials. eCalculation is given in the Supplementary materials. The average daily dose of 213 mg salbutamol corresponds to 3.89 SABA prescriptions per year. Abbreviations: BMI, body mass index; A&E, accident and emergency; OPD, outpatient department; SABA, short-acting beta-agonist. Patients initiating ICS at the index date had a mean age of 29.1 (SD, 17.0) years, 46.5% were male, 21.7% had a BMI of 30 or above, and 14.4% were current smokers (Table 2). During the baseline period, <1% of patients had any asthma-related hospital attendance and 0.7% of patients had two or more prescriptions of acute OCS with evidence of respiratory review. A summary of comorbidities is provided in Table S1. Notes: aBMI data were missing in 25.1% of patients in the ICS initiation cohort and 22.9% of patients in the ICS step-up cohort; smoking status was unknown in 4.8% of patients in the ICS initiation cohort and 3.7% of patients in the ICS step-up cohort. bAsthma-related refers to records coded with a lower respiratory code, including asthma and lower respiratory tract infection codes, or a generic hospitalization Read code which has been recorded on the same day as a Lower Respiratory Consultation (defined in the Supplementary materials). cDefined as all courses that are definitely not maintenance therapy; and/or all courses where dosing instructions suggest exacerbation treatment (eg, 6, 5, 4, 3, 2, 1 reducing, or 30 mg as directed); and/or all courses with no dosing instructions, but unlikely to be maintenance therapy with a code for asthma or a lower respiratory event; and/or no or undefined dosing instructions but definitely not maintenance therapy, where “maintenance therapy” is defined as daily dosing instructions of ≤10 mg prednisolone or prescriptions for 1 mg prednisolone tablets. dEvidence of respiratory review is defined in the Supplementary materials. eCalculation is given in the Supplementary materials. The average daily SABA use of 200 μg/day corresponds to 3.65 SABA prescriptions per year, and 800 μg/day corresponds to 14.6 prescriptions per year. Abbreviations: ICS, inhaled corticosteroid; BMI, body mass index; IQR, interquartile range; A&E, accident and emergency; OPD, outpatient department; SABA, short-acting beta-agonist. Patients stepping up existing ICS therapy at the index date had a mean age of 28.9 (SD, 18.0) years, 48.0% were male, 21.9% had a BMI of 30 or above, and 14.6% were current smokers (Table 2). Less than 1% of patients had any asthma-related hospital attendance. There was a higher proportion of patients with two or more prescriptions of acute OCS with evidence of respiratory review in the step-up cohort compared to the initiation cohort (4.0% versus 0.7%), and there were more prescriptions of SABA in the previous year in the step-up cohort compared to the initiation cohort. A summary of per-cohort comorbidities is provided in Table S1. Two-thirds of patients (67.7%) whose asthma risk was classified as “controlled” in the baseline year according to the database measure RDAC were also classified as having “controlled” (either well or partly) symptoms in the previous 1–4 weeks, based on patient-reported symptom control (Figure 1). Among patients classified as “uncontrolled” over the previous year in terms of RDAC and OAC, fewer than half were also considered “uncontrolled” based on patient-reported symptoms in the 1–4 weeks before questionnaire completion (47.3% and 47.1%, respectively). The agreement between RDAC and patient-reported control was low: Somers’d was 0.121 (95% CI, 0.083–0.158). The agreement between OAC and patient-reported control was slightly higher, but still low: Somers’ d was 0.237 (95% CI, 0.196–0.277). Figure 1 Comparison of database asthma control (RDAC and OAC) and patient-reported symptom control categories. 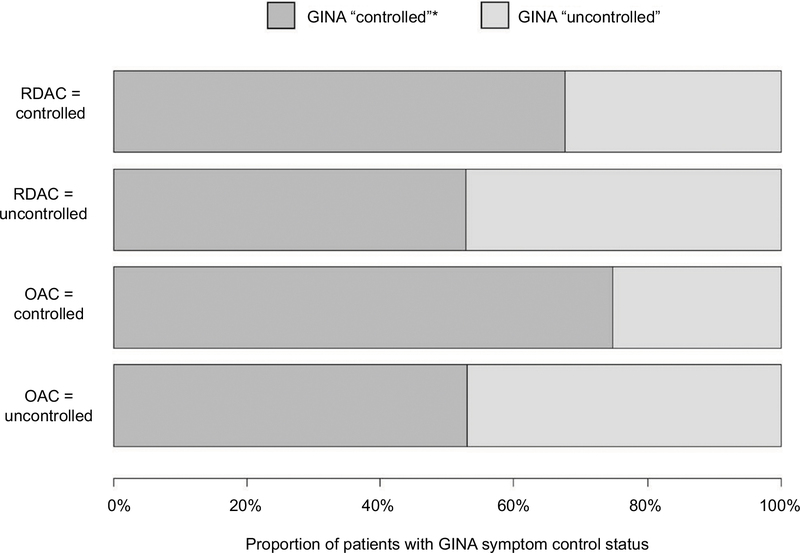 Note: *Patient-reported symptom control “controlled” category also includes patients whose asthma was “well-controlled” or “partly controlled” based on the 2014 GINA definition. Abbreviations: RDAC, risk domain asthma control; OAC, overall asthma control; SABA, short-acting beta-agonist; GINA, Global Initiative for Asthma. Of the patients who had no database records of exacerbations, 80.6% reported no exacerbations via questionnaire (Figure 2). Of those who had one or more database-defined exacerbations, 78.9% had one or more self-reported exacerbations. Overall, the agreement between patient-reported exacerbations and database-defined exacerbations was fair, with a Cohen’s kappa of 0.35 (95% CI, 0.31–0.40). After initiating ICS treatment, the proportion of patients with uncontrolled asthma by RDAC decreased from 24.9% during baseline to 18.6% during the outcome year (P<0.001; Table 3). In the ICS step-up cohort, the proportion of patients with uncontrolled asthma by RDAC decreased from 33.4% during baseline to 25.7% after the increase in their ICS therapy (P<0.001). In contrast, the proportion of patients with uncontrolled asthma by OAC paradoxically increased from baseline to outcome years for both cohorts, from 33.1% before to 46.7% after ICS initiation (P<0.001) and from 61.9% to 64.7%, in the ICS step-up cohort (P<0.001). This was due to increased SABA prescribing in the post- (versus pre-) index year, resulting in an increase in the average calculated daily SABA dose (Table 2). Notes: aP-values estimated using McNemar’s test, for OAC and RDAC, and Wilcoxon’s signed rank test, for exacerbations. bOAC status “controlled” corresponds to RDAC “controlled” plus SABA prescriptions corresponding to an average daily SABA dose of ≤200 μg/day (ie, ≤3.65 SABA prescriptions in 12 months). Abbreviations: ICS, inhaled corticosteroids; RDAC, risk domain asthma control; OAC, overall asthma control. After initiation of ICS treatment, the mean number of database-defined exacerbations decreased from 0.09 (SD, 0.32) in the baseline year to 0.08 (SD, 0.35) in the outcome year (P=0.001; Table 3). After a step-up in the ICS dose, the mean number of exacerbations decreased from 0.21 (SD, 0.60) in the baseline year to 0.16 (SD, 0.52) in the outcome year (P<0.001). In univariable Poisson regression models, having uncontrolled asthma in terms of RDAC and OAC during the baseline year was associated with a higher rate of exacerbations in the outcome year, for both ICS initiation and ICS step-up cohorts (Table 4). 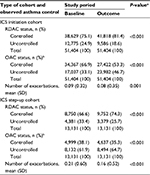 In the ICS initiation cohort, the RRs with 95% CIs were 3.33 (3.13–3.57) for RDAC and 2.78 (2.63–3.03) for OAC. In the ICS step-up cohort, the RRs were 4.35 (4.00–5.00) for RDAC and 3.23 (2.86–3.70) for OAC. Most of the disaggregated components of RDAC and OAC at baseline also had significant associations with exacerbations during the outcome year, except for asthma-related hospital admissions (in the ICS initiation cohort) and asthma-related outpatient department attendance (both cohorts). An average daily SABA dose of >200 μg during the baseline year (corresponding to dispensing of an average of 3.65 SABA inhalers) was associated with RRs of 1.24 (1.11–1.38) and 1.53 (1.37–1.71) compared to ≤200 μg, in the initiation and step-up cohorts, respectively. The strongest association with the future exacerbation rate was prescription of acute OCS in the baseline year. Compared with patients receiving no acute OCS during the baseline year, those prescribed one course in the baseline year had over four times the rate of exacerbations during the outcome year, and those prescribed two or more courses during baseline had over nine times the rate of exacerbations during the outcome year. Notes: aDefined as all courses that are definitely not maintenance therapy; and/or all courses where dosing instructions suggest exacerbation treatment (eg, 6, 5, 4, 3, 2, 1 reducing, or 30 mg as directed); and/or all courses with no dosing instructions, but unlikely to be maintenance therapy with a code for asthma or a lower respiratory event; and/or no or undefined dosing instructions but definitely not maintenance therapy, where “maintenance therapy” is defined as daily dosing instructions of ≤10 mg prednisolone or prescriptions for 1 mg prednisolone tablets. bEvidence of respiratory review is defined in the Supplementary materials. cCalculation is given in the Supplementary materials. dPatient numbers within SABA categories were not sufficient to fit model. An average daily SABA dosage of 200 μg/day corresponds to 3.65 SABA prescriptions in 12 months and 800 μg/day corresponds to 14.6 SABA prescriptions in 12 months. Abbreviations: CI, confidence interval; ICS, inhaled corticosteroid; RDAC, risk domain asthma control; OAC, overall asthma control; A&E, accident and emergency; OPD, outpatient department; SABA, short-acting beta-agonist. Results of the sensitivity analysis found consistent results within the subgroup of the ICS step-up cohort who had no further increases in therapy in the outcome year (Table S2). This study examined real-life database asthma outcomes published within the peer-reviewed literature. The findings showed that database measures of RDAC and exacerbations are responsive to initiation or increases of asthma therapy with proven efficacy (ICSs) and may be useful in assessing future asthma risk. However, limitations were identified for the database measure of OAC because of the inclusion of an SABA-based proxy for recent asthma symptoms within the definition. One of the novel features of this study was the comparison of patient-reported questionnaire outcomes with database-reported outcomes for a large number of respondents (n=2,366). Despite no previous formal validation, the OPCRD questionnaire items were derived from validated questionnaires such as the GINA7 assessment of asthma symptom control in the past 4 weeks (modified in this study to 7 days) and ATAQ21,22 for patient-reported exacerbation measures in the past 12 months. In this study, patient-reported questionnaire outcomes were compared against database-recorded control outcomes. While there are published data from a previous study designed to validate database-recorded asthma measures against questionnaire reports,25 to the best of our knowledge, the current study is the first to compare database against patient-reported asthma control measures in a large observational study design. There was poor agreement between patient-reported symptom control and the database-derived control outcomes (RDAC and OAC) for the same patients, particularly in the identification of patients with uncontrolled symptoms. The poor agreement was to be expected, as the database outcomes were evaluated over a 12-month period, whereas the PROs related to a period of up to 1 month. Furthermore, these outcomes were assessing two different domains of asthma control: future risk and symptom control, respectively. In contrast, the database and patient-reported exacerbation measures had equivalent 12-month assessment periods and so were more comparable. Patient reports are subjective measures and potentially open to both over- and underreporting. Apparent overreporting may have occurred in patients who received treatment for more than one exacerbation from a single oral steroid prescription, while underreporting may have occurred as a result of poor patient recall, especially when asked to report events over a 12-month period. Equally, under- or over-recording may occur within database measures as a result of (among other issues) incomplete data. The OPCRD, for example, is known to underreport severe exacerbations because of the lack of automatic entry within primary care records of secondary care events – only those that are manually entered by the primary care clinician are captured. This is most likely a systematic underreporting and, as such, should not affect comparative analyses between consecutive time periods (baseline/outcome years), but will diminish study power. Overreporting of oral steroid prescriptions may be present in the database if one or more courses are prescribed for ad hoc requirements in association with an action plan and not actually needed by the patient. For all the above reasons, strong agreement was not expected between the database outcomes and PROs, although both offer differing insights and perspectives: of health care resource utilization and the patient experience, respectively. Limitations of each data measure must be acknowledged in the literature and, where possible, addressed through data linkage and triangulation of results. The definition of RDAC examined in these analyses is essentially equivalent to an absence of exacerbations in the patient’s recent history and, in this analysis, was assessed over the 12-month period before and after ICS initiation or step-up. It was found to be responsive to ICS use, as the proportion of patients with uncontrolled asthma by RDAC decreased following treatment initiation and step-up. Baseline RDAC, as well as several of its components, was found to be associated with future exacerbations in our univariable analyses. Exacerbations included in RDAC were accident and emergency attendance, acute courses of OCSs, and respiratory-related prescription of antibiotics. 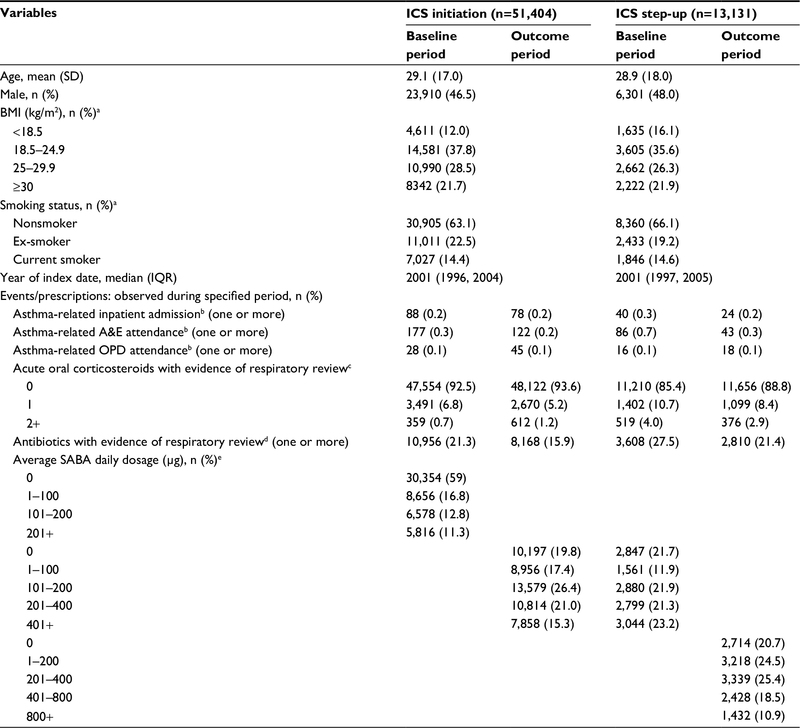 These findings are consistent with other asthma risk prediction studies, which particularly noted the importance of previous ED attendance.26,27 The association between RDAC and future exacerbations was stronger in the ICS step-up (compared to ICS initiation) cohort. This cohort would likely have had a greater proportion of patients with more severe asthma, who may be subject to disease progression, or of patients who were poorly adherent to their treatment. The underlying concept of OAC is that it takes into account both absence of exacerbations in the previous 12 months (or other risk factors for exacerbations) and recent symptom control (day-to-day symptoms in the 1–4 weeks prior to assessment).7,28 For the present analyses, OAC was based on RDAC combined with the capped average daily SABA dosage, which in turn was based on the number of SABA inhalers prescribed in the previous 12 months. In contrast to RDAC alone, OAC performed poorly in terms of responsiveness to treatment with the proportion of uncontrolled patients increasing following the initiation or step-up of ICS. The descriptive tables indicate that the poor performance of this measure is likely to be associated with the SABA component which, according to prescribing data, increased following ICS treatment. This was most notable in the ICS initiation cohort and may have been due to inclusion of patients with recent-onset asthma, and the appropriate prescribing at the ICS initiation visit of an SABA inhaler for symptom relief, thus increasing the average population dispensing. However, the classification of salbutamol use up to 200 μg/day (ie, up to 3.65 inhalers per year) as “controlled” asthma in the OAC metric is not consistent with current guidelines, which indicate that SABA use >2 days/week (corresponding to 1.08 inhalers per year) is not consistent with well-controlled asthma. The lack of granularity of SABA prescribing data limits its utility for the assessment of recent symptom control. This finding, with respect to SABA usage, supports the results of a previous cross-sectional study by Davidsen et al who reported uncontrolled asthma to be associated with increased SABA use, while conversely being associated with decreased ICS usage.29 For these reasons, the use of an outcome that includes SABA prescribing may be misleading if used in database studies that aim to evaluate the effectiveness of therapy. SABA prescribing may still be valuable, however, when investigating the risk of future asthma outcomes, as dispensing of three or more SABA inhalers in a year is associated with a greater risk of exacerbations,30 and dispensing of ≥12 SABA inhalers in a year is associated with a greater risk of asthma-related deaths.31 In the univariable models, OAC and its disaggregated SABA component were both predictive of future exacerbations. Database-defined exacerbations were found to be a responsive measure: the mean number of exacerbations per year decreased from 0.09 to 0.08 following the initiation of ICS and decreased from 0.21 to 0.16 following a step-up in the ICS dose. However, these data should be interpreted with caution, as the mean values were close to 0 (with a wide SD) owing to the majority of patients in the ICS initiation and step-up cohorts having had no exacerbations in both the baseline year (92.2% and 84.8%, respectively) and the outcome year (93.4% and 88.5%, respectively). This study used data from a large, well-validated database and is representative of patients with asthma in a real-life primary care setting. We used outcomes that are readily available in real-life primary care databases and have been used in previous observational research.16–18 We investigated definitions of asthma control that represented the two domains of asthma control recommended by the ATS/ERS Task Force,14 namely current clinical control (now often called symptom control), assessed over the previous 1–4 weeks, and future risk (ie, individual risk factors for adverse outcomes such as exacerbations). Database severe exacerbations were defined in line with a definition previously proposed by expert working groups.14,32 However, prescribing of antibiotics with evidence of respiratory review may not be optimal for identifying exacerbations, as there are strong recommendations against treatment of asthma exacerbations with antibiotics, and changes over time may reflect interventions to reduce use of antibiotics rather than changes in asthma control. We based one of the study cohorts on a step-up of ICS to medium dose; however, this does not align with current UK guidelines, in which the primary recommendation is step-up to low-dose ICS/LABA. As above, the database measure of SABA dispensing over a year proved not to be a satisfactory proxy for recent asthma symptom control. The findings from this study support the use of database-derived RDAC and exacerbations to evaluate real-life effectiveness of asthma therapies and should increase the confidence in observational research that utilizes these outcomes. Apart from allowing the analysis of large sample sizes, database measures have the benefit of being objective and routinely recorded and therefore can be evaluated in unselected real-world patient groups. Bias may arise, however, when relying on the events and prescriptions that are identifiable through an electronic database, as aspects of actual patient experience may be masked. For example, the real-life outcomes in this study may have failed to identify multiple exacerbations if the number of OCS tablets dispensed from one prescription was sufficient to treat more than one exacerbation, and the number of SABA prescriptions over a year performed poorly as a measure of asthma control. The validation of database outcomes is important, as the administrative datasets from which they are derived are not typically maintained for research purposes. Furthermore, there is the possibility of data entry errors or incomplete data entry, either at random or systematically.35,36 Issues arising from database studies should always be transparently reported. Database outcomes could be most useful in future risk studies and to differentiate between risk profiles of different asthma phenotypes. The identification of at-risk phenotypes requires large studies including heterogeneous patient populations, which can be infeasible within prospective studies and, although lacking RCTs’ traditional requirement for strong internal validity, may have high external validity in their generalizability to real-world populations.37 Of interest, database studies may also prove useful in assessing the effect of health management policies within large populations of asthma patients treated in routine care settings and observed over extended outcome periods. Furthermore, the increasing availability of, and access to, large EMR databases offers the potential to power interaction studies looking at the interplay between different comorbid chronic conditions and pharmacotherapies. Database and patient-reported asthma outcomes offer different, potentially complementary, insights into the “reality” of asthma, but they must be thoughtfully selected, clearly described and appropriately interpreted when designing, conducting and reporting observational research. Database asthma measures of RDAC and severe exacerbations are responsive descriptions of asthma health status that may be useful in the evaluation of real-life asthma treatment effectiveness and future exacerbation risk. The dataset supporting the conclusion of this article was derived from the Optimum Patient Care Research Database (www.opcrd.co.uk). The authors do not have permission to give public access to the study dataset; researchers may request access to OPCRD data for their own purposes. Access to OCPRD can be made via the OCPRD website (https://opcrd.co.uk/our-database/data-requests/) or via the enquiries email info@opcrd.co.uk. The study was designed, implemented, and registered in accordance with the criteria of the European Network of Centres for Pharmacoepidemiology and Pharmacovigilance (ENCePP; registration number: EUPAS13194). This study was jointly supported by the Respiratory Effectiveness Group and the Observational and Pragmatic Research Institute Pte Ltd.
David B Price has board membership with Aerocrine, Amgen, AstraZeneca, Boehringer Ingelheim, Chiesi, Mylan, Mundipharma, Napp, Novartis, Regeneron Pharmaceuticals, Sanofi Genzyme, Teva Pharmaceuticals; consultancy agreements with Almirall, Amgen, AstraZeneca, Boehringer Ingelheim, Chiesi, GlaxoSmithKline, Mylan, Mundipharma, Napp, Novartis, Pfizer, Teva Pharmaceuticals, Theravance; grants and unrestricted funding for investigator-initiated studies (conducted through Observational and Pragmatic Research Institute Pte Ltd) from Aerocrine, AKL Research and Development Ltd, AstraZeneca, Boehringer Ingelheim, British Lung Foundation, Chiesi, Mylan, Mundipharma, Napp, Novartis, Pfizer, Regeneron Pharmaceuticals, Respiratory Effectiveness Group, Sanofi Genzyme, Teva Pharmaceuticals, Theravance, UK National Health Service, Zentiva (Sanofi Generics); payment for lectures/speaking engagements from Almirall, AstraZeneca, Boehringer Ingelheim, Chiesi, Cipla, GlaxoSmithKline, Kyorin, Mylan, Merck, Mundipharma, Novartis, Pfizer, Regeneron Pharmaceuticals, Sanofi Genzyme, Skyepharma, Teva Pharmaceuticals; payment for manuscript preparation from Mundipharma, Teva Pharmaceuticals; payment for the development of educational materials from Mundipharma, Novartis; payment for travel/accommodation/meeting expenses from Aerocrine, AstraZeneca, Boehringer Ingelheim, Mundipharma, Napp, Novartis, Teva Pharmaceuticals; funding for patient enrolment or completion of research from Chiesi, Novartis, Teva Pharmaceuticals, Zentiva (Sanofi Generics); stock/stock options from AKL Research and Development Ltd which produces phytopharmaceuticals; owns 74% of the social enterprise Optimum Patient Care Ltd (Australia and UK) and 74% of Observational and Pragmatic Research Institute Pte Ltd (Singapore); and is peer reviewer for grant committees of the Efficacy and Mechanism Evaluation programme, and Health Technology Assessment. Helen K Reddel or her institute has received unconditional research grants from AstraZeneca and GlaxoSmithKline; honoraria from AstraZeneca, GlaxoSmithKline, Novartis, Teva Pharmaceuticals, Mundipharma, and Boehringer Ingelheim for independent medical education, from AstraZeneca and GlaxoSmithKline for independent consulting and from AstraZeneca, GlaxoSmithKline, Merck, Novartis, and Boehringer Ingelheim for data safety monitoring boards and/or advisory boards. Gene Colice is a full-time employee of AstraZeneca and holds stock and stock options in the company. Guy Brusselle has, within the last 5 years, received honoraria for lectures from AstraZeneca, Boehringer Ingelheim, Chiesi, GlaxoSmithKline, Novartis, Pfizer, Teva Pharmaceuticals, UCB, and Zambon; he is a member of advisory boards for AstraZeneca, Boehringer Ingelheim, GlaxoSmithKline, Novartis, Sanofi/Regeneron, and Teva Pharmaceuticals. The authors report no other conflicts of interest in this work. Price D, Brusselle G, Roche N, Freeman D, Chisholm A. Real-world research and its importance in respiratory medicine. Breathe (Sheff). 2015;11(1):26–38. Concato J, Horwitz RI. Beyond randomised versus observational studies. Lancet. 2004;363(9422):1660–1661. Rawlins M. De testimonio: on the evidence for decisions about the use of therapeutic interventions. Lancet. 2008;372(9656):2152–2161. Scottish Intercollegiate Guidelines Network [webpage on the Internet]. SIGN 141: British Guideline on the Management of Asthma. A National Clinical Guideline. Edinburgh: Scottish Intercollegiate Guidelines Network; 2014. Available from: https://www.brit-thoracic.org.uk/document-library/clinical-information/asthma/btssign-asthma-guideline-2014/. Accessed January 25, 2017. Global Initiative for Asthma [homepage on the Internet]. Global Strategy for Asthma Management and Prevention. Vancouver, WA: Global Initiative for Asthma; 2017. Available from: https://ginasthma.org/wp-content/uploads/2016/01/GINA_Report_2015_Aug11-1.pdf. Accessed June 28, 2017. Loymans RJ, Honkoop PJ, Termeer EH, et al. Identifying patients at risk for severe exacerbations of asthma: development and external validation of a multivariable prediction model. Thorax. 2016;71(9):838–846. Price D, Thomas V, von Ziegenweidt J, Gould S, Hutton C, King C. Switching patients from other inhaled corticosteroid devices to the Easyhaler(®): historical, matched-cohort study of real-life asthma patients. J Asthma Allergy. 2014;7:31–51. Miller MK, Lee JH, Miller DP, Wenzel SE; TENOR Study Group. Recent asthma exacerbations: a key predictor of future exacerbations. Respir Med. 2007;101(3):481–489. Price D, Chisholm A, Hillyer EV, et al. Effect of inhaled corticosteroid therapy step-down and dosing regimen on measures of asthma control. J Aller Ther. 2013;4(1):1–8. Price D, Chrystyn H, Kaplan A, et al. Effectiveness of same versus mixed asthma inhaler devices: a retrospective observational study in primary care. Allergy Asthma Immunol Res. 2012;4(4):184–191. Postma DS, Dekhuijzen R, Van der Molen T, et al. Asthma-related outcomes in patients initiating extrafine ciclesonide or fine-particle inhaled corticosteroids. Allergy Asthma Immunol Res. 2017;9(2):116–125. Price DB, Colice G, Israel E, et al. Add-on LABA in a separate inhaler as asthma step-up therapy versus increased dose of ICS or ICS/LABA combination inhaler. ERJ Open Res. 2016;2(2). OPCRD. The Optimum Patient Care Research Database (OPCRD). https://opcrd.co.uk/our-database/data-requests/. Accessed June 13, 2018. Respiratory Effectiveness Group [webpage on the Internet]. Available from: http://effectivenessevaluation.org/about-us/. Accessed October 26, 2016. National Asthma Education and Prevention Program; National Heart, Lung, and Blood Institute (NHLBI) of the National Institutes of Health. Expert Panel Report 3: Guidelines for the Diagnosis and Management of Asthma. Bethesda, MD: National Heart, Lung, and Blood Institute, National Institutes of Health; 2007. Available from: https://www.nhlbi.nih.gov/sites/default/files/media/docs/asthgdln_1.pdf. Accessed February 9, 2018. Vollmer WM, Markson LE, O’Connor E, et al. Association of asthma control with health care utilization and quality of life. Am J Respir Crit Care Med. 1999;160(5 Pt 1):1647–1652. Somers R. A new asymmetric measure of association for ordinal variables. Am Sociol Rev. 1962;27(6):799–811. Nissen F, Quint JK, Wilkinson S, Mullerova H, Smeeth L, Douglas IJ. Validation of asthma recording in electronic health records: a systematic review. Clin Epidemiol. 2017;9:643–656. Blakey JD, Price DB, Pizzichini E, et al. Identifying risk of future asthma attacks using UK medical record data: a Respiratory Effectiveness Group initiative. J Allergy Clin Immunol Pract. 2017;5(4):1015.e8–1024.e8. Yurk RA, Diette GB, Skinner EA, et al. 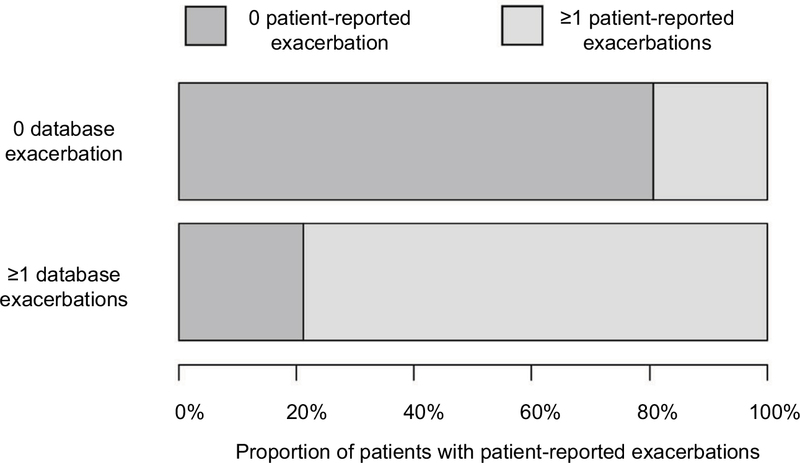 Predicting patient-reported asthma outcomes for adults in managed care. Am J Manag Care. 2004;10(5):321–328. Bateman ED, Reddel HK, Eriksson G, et al. Overall asthma control: the relationship between current control and future risk. J Allergy Clin Immunol. 2010;125(3):600–608, 608.e1–608.e6. Davidsen JR, Hallas J, Sondergaard J, et al. Association between prescribing patterns of anti-asthmatic drugs and clinically uncontrolled asthma: a cross-sectional study. Pulm Pharmacol Ther. 2011;24(6):647–653. Stanford RH, Shah MB, D’Souza AO, Dhamane AD, Schatz M. Short-acting beta-agonist use and its ability to predict future asthma-related outcomes. Ann Allergy Asthma Immunol. 2012;109(6):403–407. Suissa S, Ernst P, Boivin JF, et al. A cohort analysis of excess mortality in asthma and the use of inhaled beta-agonists. Am J Respir Crit Care Med. 1994;149(3 Pt 1):604–610. Reddel HK, Bateman ED, Becker A, et al. A summary of the new GINA strategy: a roadmap to asthma control. Eur Respir J. 2015;46(3):622–639. Reddel H, Gerhardsson de Verdier M, Agusti A, et al. P138 An innovative approach to study design: using electronic medical records to inform the feasibility and design of the novelty study (a novel observational longitudinal study on patients with asthma and/or copd). Paper presented at: British Thoracic Society Winter Meeting; 7–9 December 2016; London. Connelly R, Playford CJ, Gayle V, Dibben C. The role of administrative data in the big data revolution in social science research. Soc Sci Res. 2016;59:1–12. Stevens S; Nuffield Department of Primary Care Health Sciences [webpage on the Internet]. Big Data in Healthcare: Problems and Potential. Oxford: Nuffield Department of Primary Care Health Sciences; 2016. Available from: https://www.phc.ox.ac.uk/news/blog/big-data-in-healthcare-problems-and-potential. Accessed May 3, 2017. Price D, Bateman ED, Chisholm A, et al. Complementing the randomized controlled trial evidence base. Evolution not revolution. Ann Am Thorac Soc. 2014;11 Suppl 2:S92–S98.